There is a strong correlation between how you price low-volume, infrequently purchased incidental items and your overall profitability. Although the definition of “incidental sale” varies by industry, for the purpose of our study we defined incidental sales as an item a customer buys 3 or less times a year and on which they spend less than $250 total during a year. Annual financial statement studies consistently show that 25% of distributors earn far more than the average company in their industry. These firms’ earnings are 3 to 4 times higher than the average firm. As you review the details, you find these companies do not have an advantage when it comes to expense management. Their overhead as a percentage of sales is about average. The key difference is their gross margins…these companies enjoy gross margin rates that are +1.5 to +2.3 points higher than their peers. When you examine pricing on frequently purchased, higher volume items by industry; you see that the resulting margin rate from distributor to distributor is very similar. The most and least profitable companies price competitive items about the same. The big difference is the margin rates on about 33% of their sales…the low volume, infrequent purchases made by their customers. Here you find a big difference. Two benchmark measurements have a strong correlation to margin optimization on incidental sales. Both of those benchmarks are measurements of Margin Point Differentiation. The first benchmark is the margin point difference between infrequently purchased items and a distributors average gross margin. The second benchmark is similar; the margin point difference between items your customers spends less than $250 a year on and the distributors average gross margin. In our analysis, the average distributor had a 7-point difference between their average margin and the margin on customer-item combinations purchased three or less times annually. The most profitable distributors average a 14-point difference. The difference between the average margin and the margin on customer item combinations on which the customer spent less than $250 a year is 8 points for the average distributor. 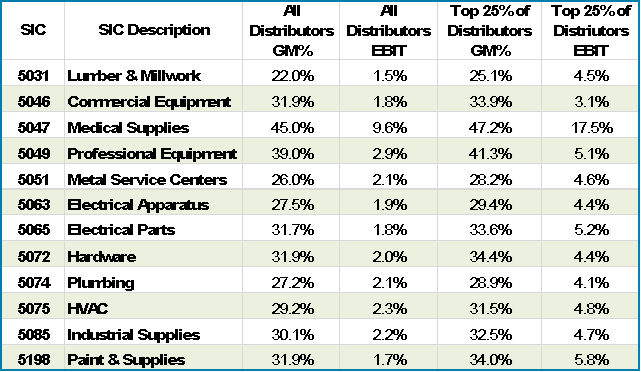 The 25% of distributors with the highest earnings enjoy a 15-point difference. Contact Us or call (913) 897-0159 for additional information on how you too can safely increase margin. Ask to schedule an executive briefing.